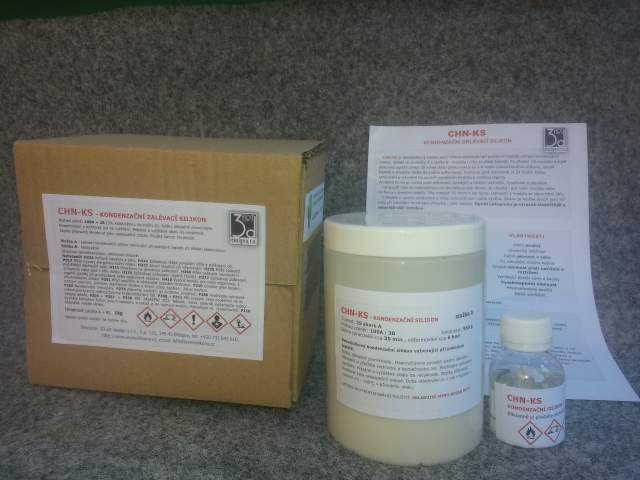 ChN-KS is two component tin cure silicone mold making rubber cured at room temperature due to condensation reaction. 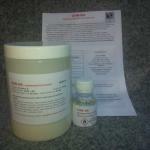 Silicone has part A and B (curing agent). After adding 2% of curing agent at the room temperature the pot life is 10-30min and after 2-6hours (depending on the thickness of silicon, room temperature and the amount of B component) it is possible demoulding rubber. The mold is fully cured after 24 hours. The cure time is possible to regulate with amount of component B and changing room temperature. The mold is resistant to deformation, high and low temperatures, acids and alkaline.s It is possible to use for production of concrete molds. 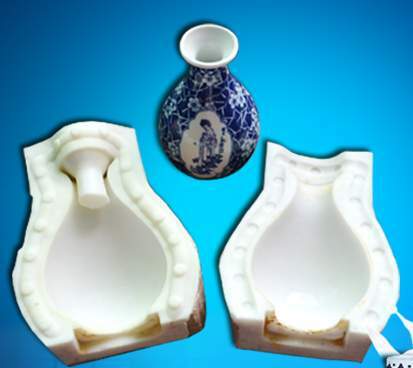 It is also suitable for small products or for molds with fine details. 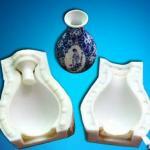 Due to hardness of 25 shore A the mold can be removed even from model with negative angles. Thanks to high fluidity and low viscosity a vacuum pump is not necessary. 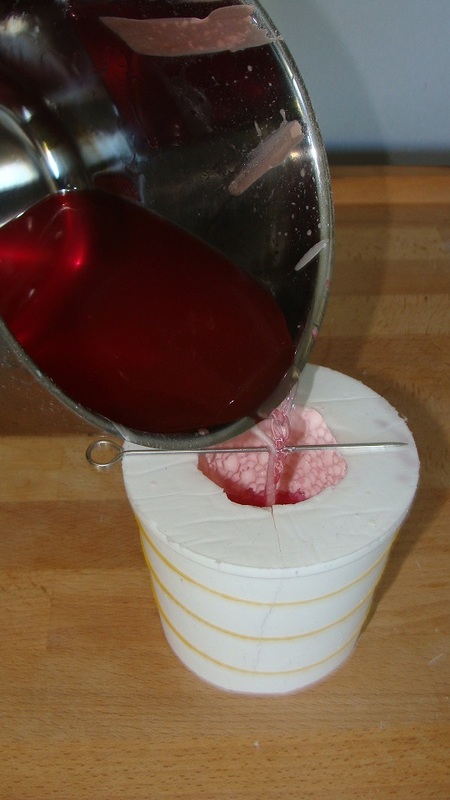 The silicon can be used as pouring or brushing (after add thixotrop). Thixotrope is additive to silicone for brushing on vertical surfaces. First, brush a thin contact layer of the silicone. After partially cured add layers to the desired thickness using thixotropic. For example, use Thi-Vex. 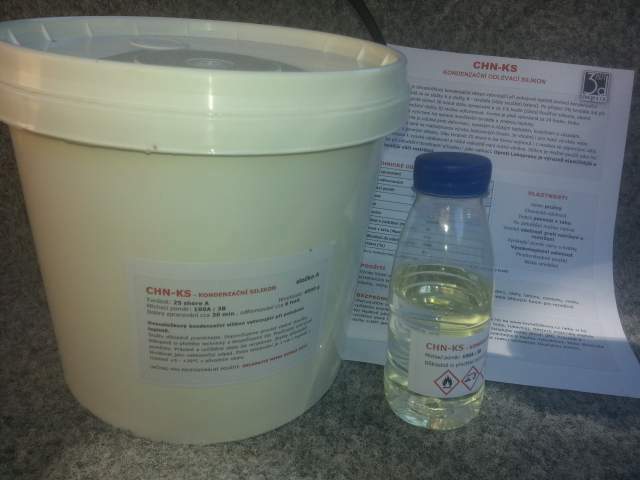 ChN-KS is possible use also for brushing after add thixotropic into silicon. Aginst Lukopren N 1522(silicon rubber) is ChN-KS more flexible and more resistance to tearing and brea. We add into offer also softer variant with a hardness of 15 Shore A (more fragile castings) and a harder version 32 Shore A (for concrete casts). We recommend a hardness of 25 Shore A as a gold center. Lukopren N 1522 has a hardness 42 Shore A.
RTV silicone rubbers for reproducing the finest detail from a variety of industrial and art related applications including reproducing prototypes, furniture, sculpture and architectural elements. 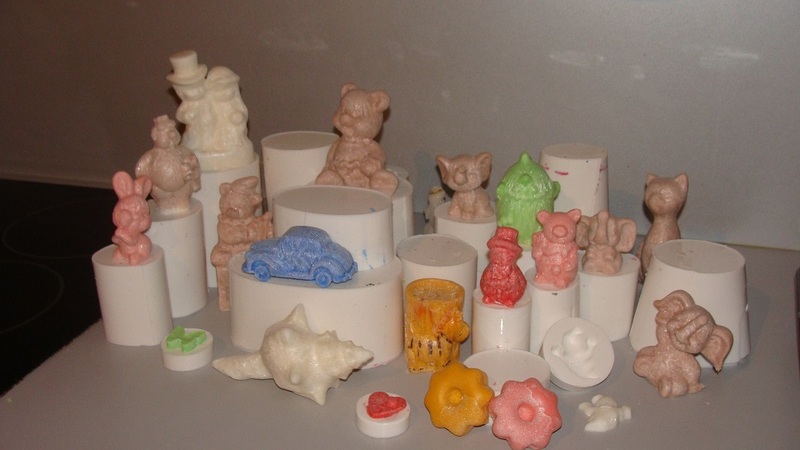 Use them to cast a variety of materials including wax, gypsum,concrete, cement, soap, low melt alloys/metals and urethane, sculptures, decorative elements of plaste, epoxy or polyester resins, etc (without using a release agent). If you want brush silicon on model, into next layer you can use Lukopren pigment. 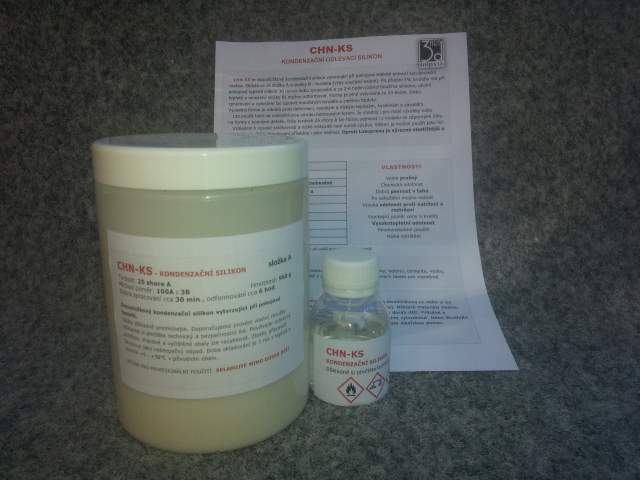 The Material Safety Data Sheet (MSDS) for this product should be read prior to use and is available on www.levneSilikony.cz or ask via email. Be careful. Use only with adequate ventilation. Contact with skin and eyes may cause irritation. Flush eyes with water for 15 minutes and seek immediate medical attention. Remove from skin with waterless hand cleaner followed by soap and water. Wear safety glasses, long sleeves and rubber gloves to minimize contamination risk. Some materials can be harmful to health. Material is used for industrial application. Keep out of children. Empty and clean packaging can be recycled. Mix rest of materials and let cured. After swallowing or allergic reaction occurs, seek medical attention. Before you begin, pre-mix Parts A and B thoroughly. After dispensing equal amounts of Parts A and B into mixing container, mix thoroughly for 3 minutes making sure that you scrape the sides and bottom of the mixing container several times. Mixture should have a uniform color with no color streaks. If you observe color streaks, continue mixing until they are eliminated. Mixing containers should be clean and dry. Míchejte materiál v dobře větrané místnosti. Vždy si udělejte malý test a vykoušejte si, zda je materiál vhodný pro Váš projekt. Odměřte si obě složky A, B. Doporučujeme váhu s přesností na gramy. Nalijte složku A do míchací nádoby a pečlivě ji zamíchejte. Do složky A můžete vložit pigmenty. Poté nalijte složku B. Pečlivě zamíchejte obě složky, dokud není barva stejnoměrná. Nezapomeňte na stěny a dno nádoby. 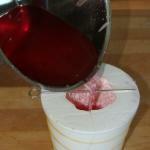 Pour your mixture in a single spot at the lowest point of the containment field and fill silicone over model. For the best results it is recommend vacuum degassing (not nessesary) for 2-3 minutes. 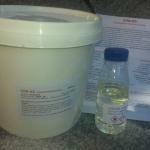 Allow to cure as prescribed (6 hours) at room temperature (23°C/73°F) before demolding. Post curing the mold an additional 4 hours at 65°C (150°F) will eliminate any residual moisture and alcohol which is a by product of the condensation process and may inhibit some resins. 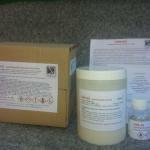 Allow mold to cool to room temperature before using. Do not cure rubber where temperature is less than 18°C/65°F. No release agent is necessary when casting wax or gypsum. Applying a release agent (Ease Release® 200) prior to casting silicones, polyurethane, polyester and epoxy resins is recommended to prevent sticking and mold degradation. You can use Ease Release 200, 205, 210. Spray release agent on surface and leave 30 min. The physical life of the mold depends on how you use it (materials cast, frequency, etc.). Casting abrasive materials such as concrete will erode mold detail, while casting non-abrasive materials (wax) will not affect mold detail. 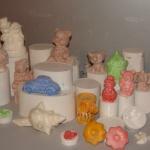 Before storing, the mold should be cleaned with a soap solution and wiped fully dry. Two part (or more) molds should be assembled. Molds should be stored on a level surface in a cool, dry environment.